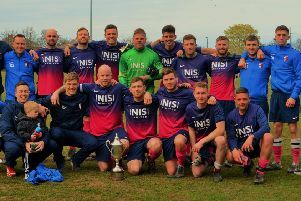 Last year United were beaten finalists in the Bay Plastics Combination Cup but they wont be making an appearance this season after being beaten in a close encounter against Newcastle Chemfica at the Leisure Centre. Opportunities were few and far between in this first half but United looked like opening the scoring ten minutes before half time. Brumwell found Cook speeding down the right and with the defence stretched he played the ball in front of goal for Ethan Bewley but unfortunately he couldn’t quite stretch his leg far enough to score. Half time came with the score goalless. Both sides had played some tidy football but they both lacked penetration in the final third to trouble the defences. Early in the second half Luke Spence took one for the team bringing down Cook in full flight for which he received a yellow card. The way the match was going it looked destined for extra time and penalties and that’s how it turned out. However there were a couple of goals in the extra period. Chemfica took the lead on 105 minutes from a long free kick into the United area which was converted by Bainbridge. Chemfica then had a golden chance to make the game safe but Liam Heenan untypically scooped the ball over the bar from six yards with the goal at his mercy. The miss proved costly for with five minutes remaining a deep cross from L’Argent found Garwood stretching in the box to plant a header past the helpless Holland. And so to the dreaded and nerve-racking penalty shoot-out. The first three penalty takers all scored. Liam Naulls continued the pattern but it was Jack L’Argent the player to suffer as he saw his shot go wide of the post. Up stepped substitute Phillip Leonard to win the match for the visitors, which he duly did and which they just about deserved.